Amsterdam Squares - which squares does Amsterdam have? Amsterdam squares are centers of activity in the already vibrant city. 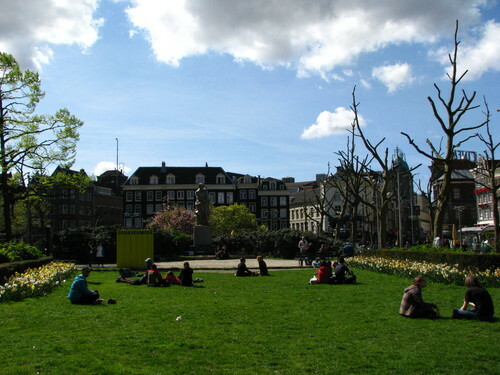 Some of the squares in Amsterdam have a large green grass field, some are focused on nightlife. Some combine both. Read all the specifics of every important square in Amsterdam below. Most famous and amost visited by tourists is Dam Square (or “the Dam” as the locals call it). 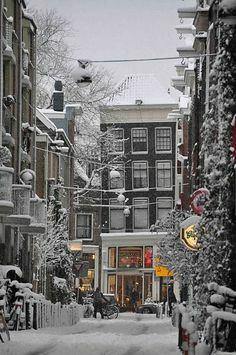 Surrounded by the Royal Palace (“Palace on the Dam”), the New Church, the Bijenkorf department store and Hotel Krasnapolsky, the Dam has the most grandeur of all Amsterdam squares. The Dam is paved with cobble stones which gives it a pitoresque feel despite the size of the square. On the square itself you will find street artists, hot dog stands and half of the time larger events such as fairs and beach soccer. 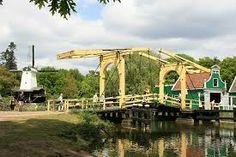 An especially good thing to do is take a ride in the enormous ferry wheel which will give you a great view of the Dam and Amsterdam as a whole. The Dam is considered the ultimate center of Amsterdam as well as the Netherlands. The latter is backed up by the fact that the Royal Family has all their celebrations here such as the marriage of the King and Maxima in 2011. And the actual crowning of the King in 2013. Every year on the 4th of May, the Royal Family takes part in a large commemoration of World War II. 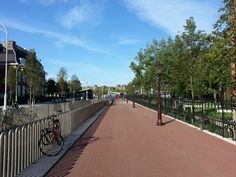 Leidseplein (“Leidsesquare”) is bordering the south side section of Amsterdam. It is primarily known for the large amount of bars, dancings and terraces. You will also find the complete range of international food chains and local restaurants in the streets around Leidseplein. If you’re looking to go have a drink and go party, Leidseplein is one of the locations you should include in your itinerary. A prime example of a classic Amsterdam nightspot is The Bulldog Palace. This large place serves as bar and place where people smoke what they bought in the coffeeshop below. The Bulldog Palace is definitely not your typical coffeeshop. Expect loud music and a flashy interior. Another two can’t miss spots are the Melkweg and Paradiso. These are Amsterdam’s main concert halls and many great artists have performed there. Both also have regular parties which are in the top range of Amsterdam’s high quality night life ranking. The Melkweg and Paradiso are located a one minute walk away in streets ending up on Leidsesquare. Rembrandtplein(“Rembrandtsquare”) is one of the top squares in Amsterdam. Like Leidseplein, this square is most known for its vibrant nightlife. This is a different type of nightlife though. 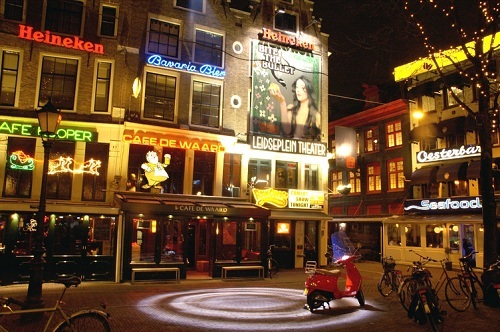 Where Leidseplein is known for its bars and concert venues, Rembrandtsquare has some of the top clubs in Amsterdam. The best example is probably Escape. 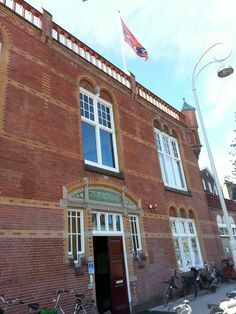 This huge club is where many Dutch DJ’s rose to national and later international fame. It has been the top club in Amsterdam for a long time and is still among the best. Another interesting club is Club Home which was previously known as Sinners in Heaven. This is one of the top urban clubs in Amsterdam. Also check out more local orientated spots like Party Crew Cafe and Jantjes Verjaadag. Rembrandtplein has a virbant gay scene as well and some of the streets surrounding the square together make up the largest gay nightlife area in Amsterdam. Check out places like Soho, Reality and the eloquently named coffeeshop The Other Side. 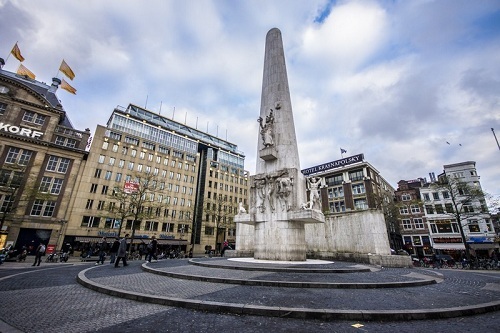 During the day Rembrandtplein offers a large square with the famous Rembrandt statue. 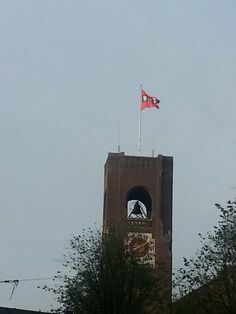 The last few years a complete nightwatch has been erected in front of the statue. There are some quality brasseries on the square as well, best known is Cafe de Kroon. Don’t forget to visit local sandwich shop Van Dobben which serves the best Amsterdam style croquet there is. East of the Red Light District you will find the Nieuwmarkt (“New Market”). 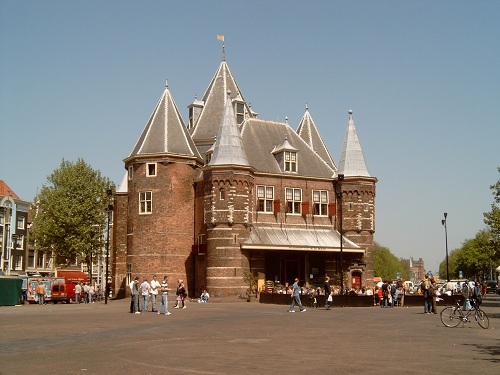 This square is dominated by the medieval 15th century building called Waag (“weigh house”). This small castle like structure is definitely worth checking out. It’s the oldest non-religious building in Amsterdam. It now functions as a restaurant so you have the chance to dine in a special environment. Nieuwmarkt is located in Chinatown, but the square itself has only one chinese supermarket. The rest consists of all type of bars, restaurants and terraces. During the day there is also a small daily market with fresh food and flowers. The most spacious square in Amsterdam is Museumplein (“Museumsquare”). 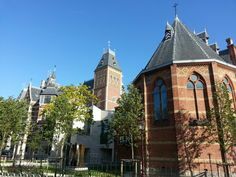 The name says it all, many of the main museums such as the Rijksmuseum, Van Gogh Museum and House of Bols are on this square. Other than that you can marvel at the Concertgebouw, one of the top concert halls in the world. A large grass field is another attraction of the Museumplein. Here, the locals play football or lay down in the summer. There are also quite a few festivals on the Museumplein. Other features of this large square are a half pipe, a pond (skating rink in the winter), and six large European style villas. 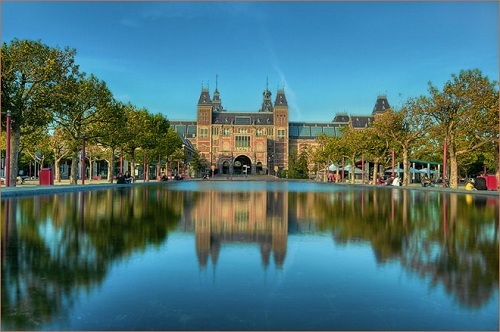 Museumplein is located in the South Side of Amsterdam.